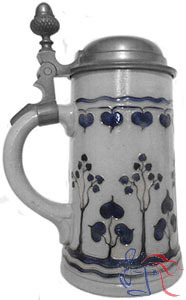 Design attributed to “Kunstgewerblehrer Schmidt”. This is one some half-dozen designs listed in old Merkelbach catalogs as having been provided by “Kunstgewerbelehrer (Arts & Crafts Teacher) Schmidt”. Although the actual identity of this designer is today uncertain, Dr. Graham Dry, in his 1981 book entitled R. Merkelbach: Grenzhausen und München suggests that he might have been either: Adolf Schmidt, a drawing teacher at the Trade School in Wiesbaden; or Prof. Philip Schmidt, director of the Arts and Crafts School in Erfurt. See also Nos. 1736 and 1737.